Gifts guaranteed to make it before Santa does. This brilliant set includes both series and is bound to keep its recipient busy on Boxing Day. 2. Stylish, stainless copper wine glasses. This good looking gift spells "class" with a capital C and "wine" with a capital "YES PLEASE." Get a set of 2 for £27.99. 3. A solid pair of bluetooth headphones. For your friend who's into tunes and more importantly, tuning other people out. Get them for £18.99 here. Tell me, is there a more perfect gift than one that keeps on giving chips? This affordable and durable tablet is perfect for your friends who love binging on books just as much as love binging on Netflix. Just because Christmas is coming to an end, that doesn't mean you can't keep the smell of mulled wine floating around the house for months to come. 7. A very serious bottle of Scotch. For Ron Swanson, or your friend who once got Ron Swanson on a "Which Parks and Rec character are you?" quiz. Or, you know, for your dad. 8. A compact and hilarious card game. This handy game travels well and is built for 2-5 players, just make sure you're playing with people who have a sense of humour. 9. A sturdy weekender bag. Give your friend who always travels a little to light the convenience of a little extra space and loads more style. 10. This stylish, insulated water bottle. For your obnoxiously sporty and fashionable friend. 11. A good looking and very reliable phone case. 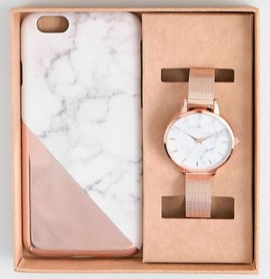 Perfect for that clumsy friend who insists on cheap decorative phone cases – this one is seriously protective but also stylish AF. 12. A perfect coffee maker. This easily transportable, top-notch coffee maker is the last one your coffee addicted cousin is ever going to need. 13. Or this lovely coffee grinder. For anyone who's a disciple of fresh pots. 14. A super lovely candle. A clear and calming scent for every friend who's hoping to go into 2018 without 2017's shadow creeping after. An elegant gift that looks way more expensive than it really is. 16. A reliable, portable bluetooth speaker. Big enough for serious sound, small enough to take on holiday. If you know somebody who calls Hogwarts their home, then this is the ultimate gift set for them. 18. 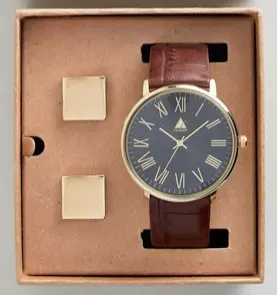 A lovely watch gift set. Good looking and thoughtful without much work. Get the rose gold set for £28 and the cuff link set for £28. 19. A customisable light box. Perfect your friend who loves a bit of whimsy, or whose fridge is out of poetry magnet space. 20. A limitless cinema card. For the friend who's already seen every damn thing on Netflix. 21. This adorable Gin & Tea set. For your wild gran, or your friend who acts like one. For the coolest homebody you know. 23. A Lumie alarm clock. For your friend who has legit New Years ambitions.